I’m so excited to be posting this recipe. First of all, this is a heavenly cookie. It’s so heady with almond flavoring. It’s sandy sweet and melts in your mouth. And it’s my friend Kaki’s favorite cookie, so every time I make these cookies, I think of my pal. This year, I thought it would be a good time to tell you all the ways I love this cookie, and then it occurred to me that my Gluten Free friends needed a way to share the love. And I knew just the person to ask for help. Meet my friend Jeanne. She’s a fantastic baker I first met on Twitter, then in real life, here in DC, when she and her lovely family visited last Spring. And then we met up in NYC! Don’t we sound like the jet-setting bloggers? We’re not. It was just serendipity, but lovely serendipity nonetheless. Jeanne has more than conquered gluten free baking, she’s made an art of it. Yes, everything from puff pastry to breads, and all just beautifully. 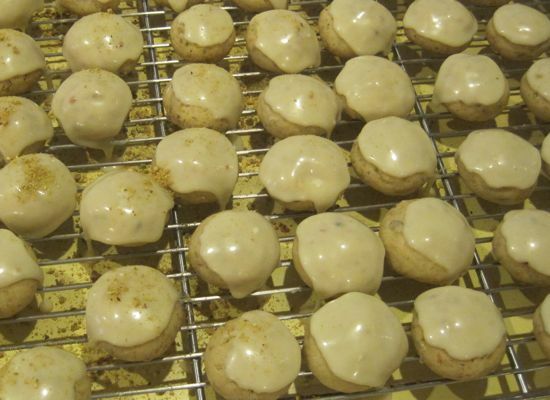 I think it’s a great idea to include gluten free goodies in your holiday cookie baking, and Jeanne’s gorgeous blog, The Art of Gluten Free Baking, has a lot of wonderful ways to do just that. Here’s her take on this cookie. Pretty, pretty, right? 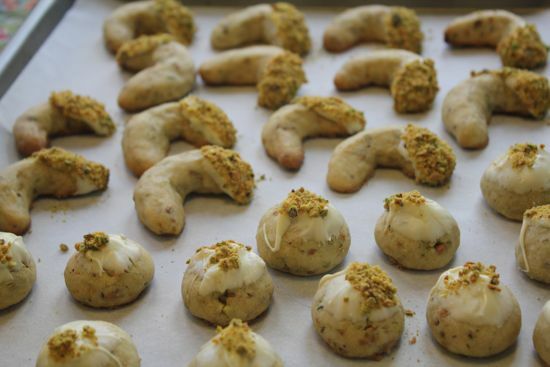 These are easy cookies with just five ingredients – butter, confectioner’s sugar, flour, pistachios and almond extract. You can make it extra special with white chocolate ganache. Try forming the cookie into crescent shapes. Or, if it’s just too much, sprinkle well with powdered sugar. Just depends how fancy schmancy you want to get. And please, please, let the dough rest overnight in the refrigerator. It really helps the flavor of this cookie develop. Cream the butter and sugar together. Add the extract and beat well. Add the flour and beat until combined. Add the nuts and beat until everything is combined well. Turn the dough out onto a piece of plastic wrap. Form a block about 4″x 4″ and wrap well. 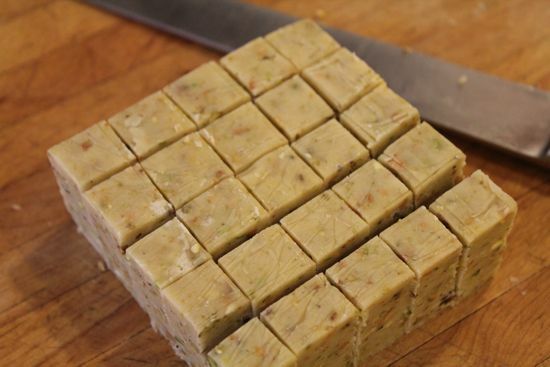 Cut the block into 1″ cubes. Roll into balls or form into crescent shapes. Chill for 15-20 minutes before baking. 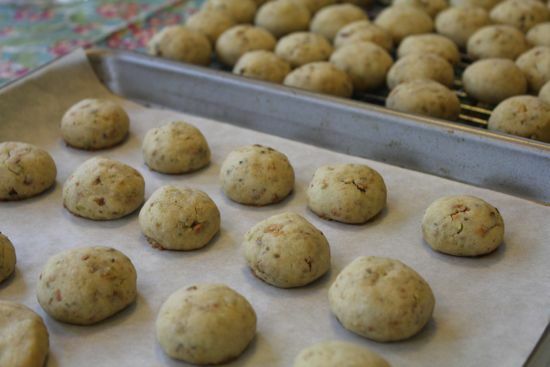 Place cookies on a parchment lined cookie sheet about 1″ apart. They will not spread much. Bake 13-15 minutes, watching carefully. The bottoms should be toasty brown, but the tops will barely color. 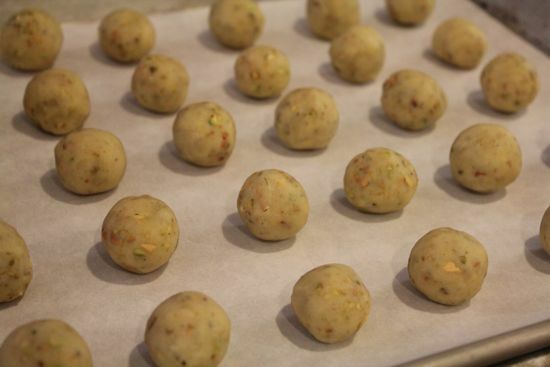 Allow to cool on a rack for a minute or two, then remove to a rack to fully cool. 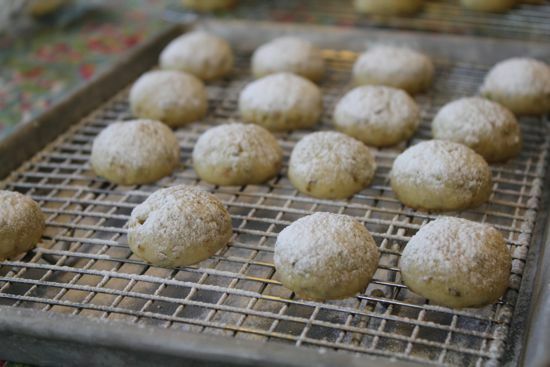 EITHER Using a small sieve, dust the cookies with confectioners sugar until well covered. 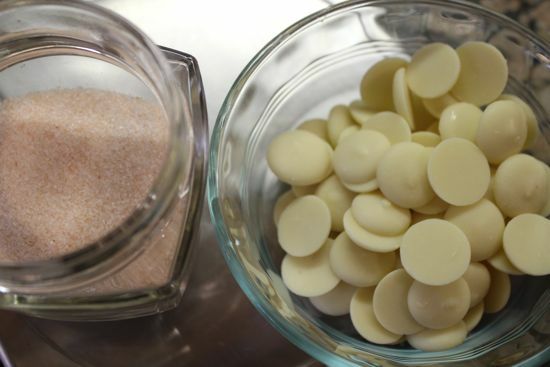 OR Frost with white chocolate ganache and then sprinkle with additional chopped nuts or, sparsely, with Himalayan Pink Salt. Heat the cream to just below boiling. Pour over the chocolate and let it sit for one minute. Dip the cookies into the ganache and then allow the excess to drip off the cookie. Dip into the chopped nuts, if desired. Place on a cookie rack and allow the chocolate to set for an hour or so. These cookies keep well for up to two weeks, if layered between wax paper sheets in an airtight container. Love the way that you and your friend posted your recipes in tandem…food is so about friendship, isn’t it? These are just gorgeous and I agree: Jeanne is an artist. I have never made (or even heard of) sand dabs but I will definitely be making these this Christmas! Do you suppose milk chocolate is too overpowering? YAY! Thanks for the hook-up to a gluten free baker. 🙂 It’s practically torture to look at those gorgeous cookies and not be able to eat them. I made my husband eat them and explain to me, in great detail, exactly what they tasted like so I could pretend like I knew. You’re going to LOVE Jeanne’s blog, Holly! Hi Cathy – I just finished making the dough for these, using your proportions, but I only wound up with a block of dough about 3″ by 4″. Is it possible that your 6″ by 6″ block was for a double batch? Thanks! I’ve made the adjustment. Also expect your yield to be about 18 cookies.